Based on some reviews, the Kinvara 7 has a breathable and comfortable upper coverage. The welded thin film overlays called the Flex Film secures the foot in a snug fit. Runners generally welcomed the moisture wicking qualities of the RUNDRY Collar Lining. The SSL EVA is a mid-sole component that’s durable, lightweight and responsive. The EVERUN Heel Insert assists in returning energy to the wearer during heel striking. The outsole were durable enough for road running, according to user reviews. The Saucony Kinvara 7 is available in 7 different color options. Some runners felt that it was a bit tight in the mid-foot area. Others experienced the sole unit remain inflexible even after wearing it a few times. A few noted that it was one size smaller than what they were used to. The testers said that the mid-sole wasn’t as comfortable as the previous version. The Kinvara 7 from Saucony is a running shoe that provides adequate service to those who want a comfortable running experience. It can handle up-tempo running and daily trainings, which are great activities for beginners and advanced athletes. Based on the reviews, the Kinvara 7 has been positively accepted by the users. Saucony Kinvara 7 - It's (almost) sprint time! The reason why I got the Saucony Kinvara 7 can be summed up in two words: light and durable. These shoes are incredibly light, weighing at a little more than 200gr (about 7.5oz) for a size 9, which I think is awesome, to say the least. As soon as I got them I tested them on asphalt, its natural habitat, that's where they truly shined as competition shoes. The very first thing I noticed about these shoes is how responsive they are. Change of pace comes like the most natural thing in the world with the Kinvara. It does that without sacrificing comfort, which is the perfect combination for long-distance competitions. The Kinvara 7 comes with a special outsole, which is the result of combination of the IBR and inserts of the softer IBR+ (1) in the midfoot area for better cushioning on impact. The third outsole material is the denser XT900 rubber, which is in the heel and toe area. The aim is to improve durability by reducing abrasion during toe-off or when occasionally landing on the heels while going down. The Kinvaras have a 4 mm drop and let me tell you, this is just in the sweet spot for me. I felt sprinting and going fast came much easier and the shoes responded well to slowing down to an autopilot pace, too. The mesh used in the Kinvara 7 is very breathable and quite soft, with thin plastic-like reinforcements for the areas where the foot tends to push more in a material called Flexfilm. The heel area and the tongue are well-padded and built using the Run Dry technology which wicks off moisture quickly. I had run in these shoes in 10 cm deep snow in the Bulgarian winter and they surprisingly performed really well in that department, keeping my feet dry and snug. The Kinvara 7 introduces an innovative material called Everrun for an increased force return and thus responsiveness. This as far as I am concerned is absolutely true, although I believe it made the shoe definitely more reactive, thus sacrificing a bit of cushioning. The Kinvara 7 is a well-designed shoe, without any fancy useless extra. My guess is that at Saucony they definitely wanted to keep the light weight no matter what and they definitely succeed in that. I am not a big fan of fluorescent colors like the ones I am running in now, but if you don't mind getting noticed these are exactly what you need. I think these shoes deserve some mention as far as the lacing system is concerned. The laces come a bit too short for those who want to go ahead and use all of the holes to prevent heel slippage. Also, the shoes come with a quite atypical midfoot locking system called ProLock, which in my opinion is quite unnecessary and makes for an uneven feel. I got the Kinvara 7 for about 100 dollars and considering the weight, the quality of the materials and the amount of thought in the building of this shoe, I have to say these are definitely a bang for the buck. Lightweight, fast, with good cushioning, outsole built for durability and all of this at a reasonable price. The only negative remark is the ProLock system, which I think is useless. Nothing's perfect, but we're getting close, Saucony! 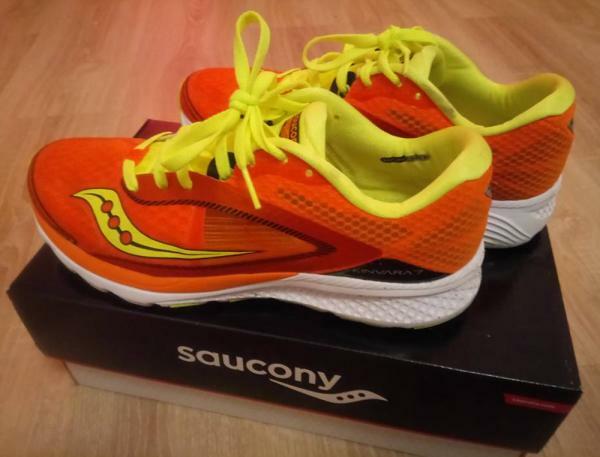 This is a shoe that could easily be your shoe for anything from a 5K and up and at a consistent $110, the Kinvara continues to be a lot of bang for your buck. It's still the same Kinvara; great for training long distances, marathon, half marathon and then race in them. The Saucony Kinvara 7 features an updated seamless upper, making it more durable compared to the older version. It used the Flex Film technology for a secure and snug fit. The Kinavara 7 utilizes the new EVERUN Heel Insert. It replaced the POWERGRID insert of its predecessor in order to provide an efficient energy return, for a smoother and faster toe-off. The 7th version of the Saucony Kinvara comes with an updated outsole. It uses new technology to provide an enhanced traction, durability and flexibility. Nothing was changed in the updated version of the shoe. The Kinvara 7 is still available in a standard shoe length. Just like its predecessor, it is ideal for those with standard foot measurements and who love to let their toes naturally splay while running. The XT-900 element is found in the entire outsole unit. It is a carbon rubber material that offers durable traction for varied surfaces. The Tri-Flex Design, which is new to this version and found also in the 10th version of the Kinvara, gives an improved ground contact. It increases the flexibility of the shoes as well. This works efficiently with the Saucony’s IBR+ technology that gives added cushioning for a smoother ride. The midsole of the Kinvara 7 utilizes the EVERUN Heel Insert. It offers an efficient energy return for a more flexible running experience. This element also provides sufficient shock cushioning. It also uses the SSL EVA foam that is soft and lightweight. This technology gives added durability and energy-rebound attributes for a responsive ride. The Flex Film Overlays of the shoe’s upper is a new feature of the Saucony Kinvara 7. It is a thin film attached to the upper in order to give a secure and snug fit. The improved upper gives great lockdown for every stride. The upper also features the RUNDRY Collar Lining. It secures the heel while keeping the foot cool and dry though it moisture wicking properties.